Youch! Do you have a toothache that’s preventing you from focusing on just about anything else? If so, there may an infection in the dental pulp, which is the delicate nerve tissue located at the center of every tooth. 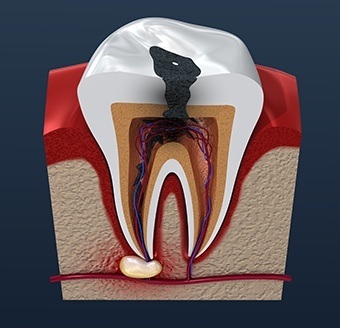 This kind of issue can be the result of either a cavity or crack in the enamel, and the best way to stop the pain is with – yes, you guessed it – a root canal. Dr. Fifadara can use this safe and proven procedure to not only relieve severely hurting teeth but save them from extraction as well. Plus, thanks to her gentle approach, patients can trust that the treatment will only cause minimal discomfort! Why Choose Fulshear Dental for Root Canal Therapy? First and foremost, your tooth and the surrounding area will be numbed with local anesthetic. Dr. Fifadara will then create a small hole in the enamel so she can access the infected pulp. The pulp will be sufficiently removed. The inside of the tooth is cleaned, sanitized, and filled. At a follow-up appointment, the tooth will be further restored with a dental crown. Between the local anesthetic and Dr. Fifadara’s light touch, most patients find it very easy to stay completely comfortable during this often-feared procedure.